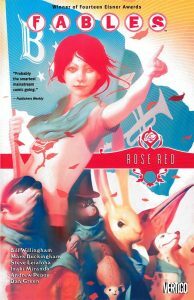 The big plot of Rose Red revolves around the Fables formerly of Fabletown, now retreated to their last stronghold on earth, continuing to fight against Mister Dark (who plausibly I mentioned last time). And that plot progresses, which is all fine and good, but I’m not really here to talk about that. For one thing, spoilers. More importantly, though, the flashback story that gives the book its name is the more interesting one. See, Snow White’s sister has been a pivotal character in this series since the very beginning, and it’s about time we learned why they’ve always had such a bad relationship. Thanks, flashback! And of course, thanks Bill Willingham for making sure the story made sense from both directions. It’s a rarer talent than it should be. This entry was posted in Words and tagged fantasy, graphic novel on June 1, 2017 by Chris.